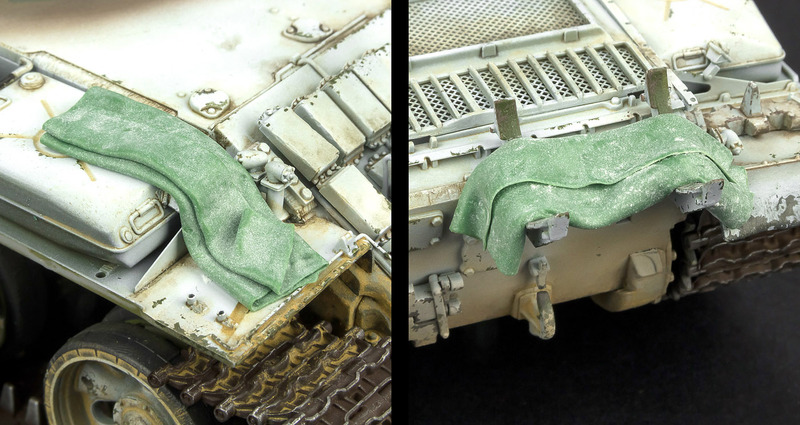 We have already seen an inbox review plus a construction review of this kit, but today Andy’s build of the Takom T-55AMV kit in 35th scale finishes with a painting and weathering tutorial. See how he finished this kit in an African Union colours in today’s article. In part II we left off with Takom's excellent new T-55 AMV built up, and ready for paint. So, with the compressor fired up and the airbrush primed, it's spray(n’) time! ...And what colour are we going to spray it? Well, I chose the African Union option from the 12 schemes included with the kit, and that tank is finished in overall white. Clearly then, the first step is to spray it all green! OK, that may seem a little odd, but there's some method to my madness (some may disagree), as the green base will add shading to any areas the white doesn't cover, and will allow me to add some paint chipping with masking fluid. Actually, the first step was to paint all those areas that would be partly obscured by the various stowage boxes and fuel tanks that, up till now, I'd left separate. Once that was done, the boxes were attached, and the whole tank received an overall coat of green. The actual shade used isn't that important, as the majority of it will be covered by the white. In this case, it was mainly done with Tamiya NATO green, but any medium to dark green tone will do. You can see that I added some subtle shading and highlighting to the green. None of that will show up in the end, but it never hurts to use an opportunity like this to practice your airbrushing techniques. The side skirts, still without their ERA blocks attached at this point, were base coated in the same green, after which the rubber sections of the skirts were brush painted in a dark grey. Again this will be covered by the white, but you need the correct underlying colours to show through when the chipping is done. The two track runs were primed with a mix of AMMO rust and black primers. As well as priming them, this would form the main base coat for the tracks without the need for additional painting. With the green base applied, I gave the whole model a light gloss coat, as the smoother surface allows the masking fluid to be removed more easily. For the masking, I used Gunze Mr Masking Sol Neo as this is perfect for this type of application, being slightly thicker than other masking fluids. The Gunze Neo was applied with a piece of torn sponge, dipped into the fluid, then dabbed onto the model, concentrating on areas that would naturally get the most knocks and scrapes. On the turret, parts like the search light and areas around the hatches, where the crew would clamber aboard were given the masking fluid treatment. I also masked off a few of the ERA blocks using silly putty, as I wanted these to remain in green to resemble replacement bricks. Silly putty is perfect for this, as it's very stretchy and malleable, and won't leave any residue on the paint when removed. In the build, I'd left some of the ERA bricks off the front of the tank, as many of these tanks, especially those in Africa and the Middle East, seem to have missing bricks. I wanted to give the impression that the bricks had been removed or lost after the white AU finish had been applied, and would, therefore, reveal the original paint colour underneath... To do this I simply stuck the missing blocks back in place as a temporary mask, securing them with small blobs of blue-tak. With everything now ready, it was time for the white, and it's a colour I've never got on with for airbrushing. Most white paints I've tried are either too grainy and leave a rough surface when sprayed, or they're too transparent. For this build, I tried AMMO white, and it was a bit of a revelation. It sprayed beautifully (thinned here with Gunze Self Leveller), leaving a really smooth finish, but had enough colour density to cover the green without looking patchy. As I wanted a satin finish, but only had matt white, I tried mixing a little Tamiya X-22 clear into the AMMO white. I wasn't sure if these two paints would be compatible, but they mixed together fine and left a nice satin sheen. Once the white was dry, the masking was removed to reveal the paint chips and green ERA blocks. Back in the build stage, I'd painted the areas covered by the bricks in green so any areas not hit by the white would show the original colour. As it turned out, the white covered most areas anyway, but it was a worthwhile insurance policy all the same. I controlled the build-up of white around features on the turret and hull allowing the green to act as a pre-shade. To enhance the masking fluid chipping, I added more chips with a fine brush and a sponge, again concentrating on those areas that would get the most wear and tear. These chips were done with AMMO NATO green, as it's much easier to apply by brush than Tamiya. I also lightly over-painted the ERA blocks that I'd previously masked in different shades of green to show replacements that had come from different supply stocks. The side skirts also received masking fluid chips, showing the underlying rubber colour. The ERA clusters could now be added. These were secured with superglue to avoid any possible damage to the paintwork if I'd used regular styrene cement. And that effectively finished the painting stage. No complex camo's here. I left the lower hull in the base green as this area is obscured by the side skirts and can't be seen on the final model. Time now for the decals and this is where I saw a potential problem. Not with the decals themselves, as I've always found Takom's decals to be fine, but with where they had to go. 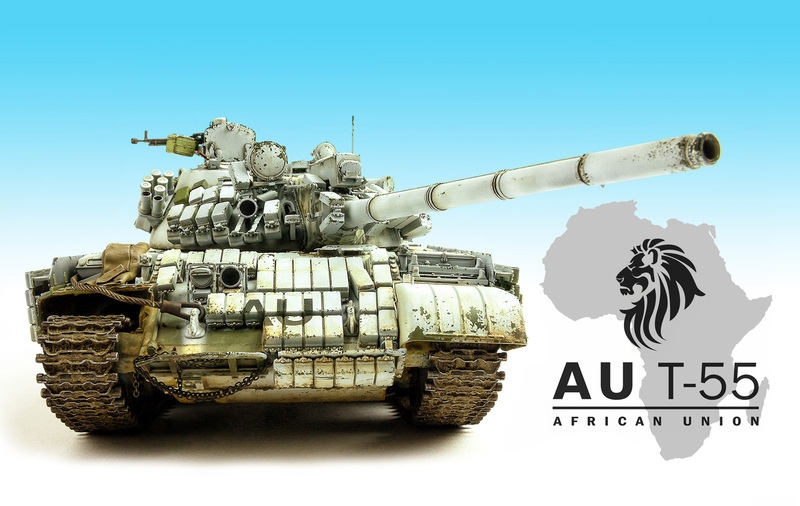 There are only three decals required for the African Union tank I'm building, these being the AU logos that go on the front and sides. All three need to sit over the ERA blocks, and I thought the chances of getting them to bed down over the blocks was slim. There were two options here. Either I could cut the decals into individual sections for each column of blocks, or I could cut a mask and spray the markings. I chose the latter method as this, of course, is how the markings would be applied on the real tank. To start with I stuck a piece of Tamiya masking tape over the decal sheet and traced the outline of the letters. The tape was peeled off the decal sheet and stuck to a cutting mat. The, using a new blade, I carefully cut along the pencil lines. A steel ruler was used for the straight sections but the curves had to be done free-hand. This isn't that hard if you take your time and use a sharp blade. The mask was then applied to the model, making sure to align it squarely. If one of the markings wasn't straight it would spoil the model, and be very hard to rectify, so take extra time when placing the mask. I only cut one mask so I had to be very careful when lifting and reapplying it so as not to stretch or deform the tape. The results looked much more realistic than the decals would have done. A couple of drops of grey were added to the black paint to take the starkness off the finish and leave a more faded look. You can also see here the areas on the glacis which were masked with the spare ERA bricks. The blocks under the AU logo were put back in place while spraying the markings. The wheels had also been base coated in green, but in this case, I used hairspray chipping for the white paint. Only the faces of the wheels were painted white, with the inner sides and rear left in green. The tyres were then hand painted in a dark rubber colour. Takom have moulded beautiful bearing detail under the wheel hubs and it seemed a shame to cover that detail up, so one of the hubs was left off. Probably not realistic, but it's conceivable that one could have been lost on operations. I painted the exposed hub area in a red primer colour, which also helped add a bit of interest to the otherwise monotone finish. The idlers and drive sprockets had their contact points polished with AMMO gunmetal pigment. The sprockets also had a rust wash on the inner surface. On to the weathering stage and I wanted to be careful here to give it a used look without discolouring the white finish too much. To start off I applied a wash of AMMO Ochre PLW (Mig-1622). This was applied somewhere between a pin wash and a filter, thinning it to lightly tint the surface and applying heavier layers here and there, allowing it to pool around surface detail. The effects of using the wash as a filter can be seen on the right-hand fuel tank. The left one is yet to be treated. The ochre wash is subtle enough to not obscure the white paint but adds a nice dusty look to the model. I concentrated the heavier build-ups around areas that would naturally get dirtier like the driver's hatch and corners of the fenders. Now darker washes were added to give more contrast to the finish. These were applied to shadow areas and around surface details leaving the model with a nice, grimy patina. In some areas, I applied the wash with a piece of torn sponge to leave a more diffuse, mottled finish. Not much of the lower hull and suspension is visible once the side skirts are on, but I wanted to add a little dried mud and dust to those areas that would be seen. African soil can be quite vivid in colour and I'd got a pot of one of the new Alclad pigments that looked suitable. This is labelled as Light Earth, but looks too strongly coloured for most European soil, but should be OK for Africa. Even so, I didn't want it to be too intense, so I added some Vallejo Light Sienna pigment to tone it down. This was scattered over the lower hull, then fixed in place with AMMO pigment fixer. The same pigment mix was combined with the AMMO Ochre wash I'd used previously and flowed around the details on the wheels. The wheels and tracks could then be installed. The tracks were given a light dry brushing with silver to give them a worn look. When I came to install the right-hand track run, I realised that I'd not allowed for the fact that I'd left the front mudguard off on that side. This meant that more of the upper track run would be visible, and I needed to add a few extra links. A short run was made up, painted, then dropped into place. Much of this area is in deep shadow once the skirts are in place, but at least it looks like there's something back there. To personalise the build a little, I added a couple of rolled up tarps, one on the front fender and one hanging on the rear fuel drum bracket. These were formed from Kneadatite 'Greenstuff' epoxy putty, rolled out thinly then draped onto the model and left to harden. With the side skirts in place, I added the last bits of weathering including some streaking using the previous washes, and some staining around the exhaust. The last couple of things to add were the rear fuel drum and the unditching beam. I felt the model needed a splash of colour to contrast with the white, so I decided to finish the fuel drum in a non-military colour, in this case blue. The drum was base coated in a dark rust colour while the beam was painted in a pale wood tone. Both were given a couple of coats of hairspray ready for some paint chipping, followed by their respective top coats. They were chipped with warm water and a stiff brush then, once the paint had fully dried, were weathered to match the rest of the tank. Last minute additions were a length of rusty chain hanging from the front ERA frame and a coil of rope made from thin braided copper cable from an old USB lead. This was painted orange to add a further splash of colour to the finished model. And that completed the build of Takom's new T-55 AMV. This has been a project that I've had a lot of fun with from start to finish. There were a few challenges along the way, principally the poorly moulded headlight guard, but that meant I had to stretch myself to try scratch building a replacement, and being able to add your own mods like that, for me at least, enhances the build and makes the end result more personal. The bulk of the rest of the kit went together easily which, considering the complexity of the ERA structures, is a testament to Takom's engineering. This is a great kit, but if the ERA version doesn't appeal, Takom have an expanding range of T-54/55 variants, so there's sure to be one that ticks all the boxes for you.